The Palestinian leadership is afraid to make the inevitable transition from leading the struggle to governing a sovereign state and having to provide services to its citizens. It is easier to blame Israel for whatever goes wrong. BDS serves Abbas’ goals well. It is nonviolent, but one can say that BDS is a form of jihad, in the sense that it is not military, and can mobilize public opinion and generate pressure on the Jews – who, in its view, are motivated solely by money and political considerations. Palestinian Authority Chairman Abbas, like his predecessor Yasser Arafat, could already have brought about a Palestinian state through an agreement with Israel many years ago. The Palestinian leadership, however, is afraid to make the inevitable transition from leading the “struggle” to governing a sovereign state and having to provide services to its citizens. It is easier to blame Israel for whatever goes wrong. The Palestinian economy is still based on agriculture, commerce, and light industry. The largest economic sector is the stone industry – mining, sawing, and supplying stone for construction in Israel, the Palestinian Authority, and Jordan. The average monthly wage in the PA is 1,500 shekels, without social benefits. However, about 80,000 Palestinians daily go to work legally in Israel, along with about 25,000 Palestinians who work in Israeli industrial zones in Area C of the West Bank. They earn an average of 5,700 shekels per month and receive social benefits and health insurance as required under Israeli law. Whereas the funds contributed by the world are funneled to the PA, the income from work in Israel supports a second and third circle of the Palestinian economy and provides the money that is needed to conduct commercial and economic life. In 2014, trade between Israel, the West Bank and Gaza amounted to 3.9 billion shekels, a sum that constituted 68 percent of Palestinian imports and 5 percent of Israeli exports. The traveler on the roads of the West Bank, the visitor to the Palestinian cities of Ramallah, Bethlehem, Nablus, the Palestinian Authority-controlled part of Hebron, and even the refugee camps, notices many late model vehicles and a surge of new construction. Where does the money come from? It turns out that Palestinian banks provide residents with generous credit, on the tab of international aid monies, as long as they do not work in Israel or in the settlements. It is not clear, though, where they will find the money to pay back these loans once that employment ends. What will be the impact of an economic boycott of the products of the West Bank settlements and the Israeli industrial zones? Already in 2010, the PA announced a boycott of the settlement products, aimed at preventing their use in the Palestinian market. Except for the huge housing project in Rawabi, which is making use of engineers, planners, advisers, raw materials, and professionals from Israel but not from the settlements, the boycott has been a failure. Most of the Israeli products have no worthy substitute in the Palestinian market, and many Palestinians prefer Israeli products, whose quality accords with international standards, over cheap, poor-quality Palestinian substitutes. Numerous Palestinians prefer to shop for household items in the large shopping centers in the Israeli industrial and commercial zones in the West Bank, though the last five years have also seen the opening of upscale shops in the Palestinian cities. Boycotting the settlement products will likely cause the Israeli export-based factories to move from the industrial zones in the West Bank to other development zones in the Israeli periphery. There the factory owners receive economic benefits from the government, but instead of employing Palestinians, they will employ Israelis or other labor migrants at the same wage, while thousands of Palestinian workers will be left without suitable employment. According to estimates, out of the 25,000 Palestinians employed in the settlements, fewer than 500 work in agriculture, about 2,500 work in construction within the settlements, and about 21,500 work in the Israeli industrial zones. It is mainly these workers who will be harmed by an international boycott. The unemployment that will result in the Palestinian labor market will foster bitterness, which, along with social and economic pressures, could bolster opposition factions led by Hamas, which represents the Palestinian Muslim Brotherhood. The PA, which has no alternative plans or employment possibilities for the workers who will stream into the labor market, will as usual direct the anger at the Israeli occupation authorities, and this anger will ensue in violence. Another phenomenon, not well known, is the growing number of industrial plants run by Israeli Arabs, Palestinian residents of east Jerusalem, as well as West Bank Palestinians who purchase or lease these plants within Israeli industrial zones in the West Bank and east Jerusalem. Will BDS harm them, or will it simply make a racist distinction between plants owned by Jews and Arabs? Clearly, the direct outcome of the Palestinian boycott of settlement products will be a mortal blow to Palestinian employment, which will also damage cycles of consumption and commerce. The PA offers no productive alternative to such employment, and the decreased standard of living will lead to violence and the strengthening of the radical Muslim elements that seek to destroy Israel and are not interested in any peaceful solution. Hence, it will turn out that any boycott the BDS movement instigates will primarily harm Palestinians, and, instead of goading Israel to cease building in the settlements and reach a diplomatic solution with the Palestinians, will foment violence and terror and push the Palestinians further from an independent state. The unemployment that will result in the Palestinian labor market will foster bitterness, which, along with social and economic pressures, could bolster opposition factions. Israeli industrial zones in the West Bank. The Israeli industrial zones in the West Bank constitute a model of economic cooperation that serves the interests of Palestinians and Israelis. Despite the extensive international aid to the PA, the Palestinians are not developing industrial and employment zones in the territories they control. Notwithstanding the Palestinian charges Israel is preventing such initiatives, the Israeli government, through coordination of activities in the territories and through the Regional Cooperation Ministry, is making every effort to overcome the bureaucracy and enable the rapid transfer of raw materials and goods to the industrial zones and, from them, to the export destinations. Yet, to this day, the industrial zone has not been built. In the Bethlehem area, the French government has invested a considerable sum, and helped establish an industrial zone south of the city in an area under full PA control. France offered tax breaks for goods to be produced in the zone and exported to France, and through it to the European Union. In practice, however, despite the fact that infrastructure has been built in the zone with Israeli assistance, only four factories operate in it that employ only a few hundred workers. In the Jordan Valley, near the town of Jericho, the Japanese government has invested a considerable sum to develop an industrial zone in Palestinian-controlled territory. Intended to be the flagship project of the “corridor for peace and prosperity” between the PA and Jordan, the zone is supposed to process Palestinian agricultural products and thereby encourage agriculture. The goal was to employ about 7,000 workers. The Israeli Civil Administration dealt with planning the roads and the infrastructure network. So far, though, the zone includes only five factories employing fewer than 1,000 Palestinians. Despite the extensive international aid to the PA, the Palestinians are not developing industrial and employment zones in the territories they control. The second type of industrial zone is situated on land under Israeli civil and security control, close to the Palestinian crossings with Israel, like the Erez and Karni industrial zones in the Gaza Strip. Israeli and foreign investors operated those zones, employing thousands of Palestinians. Security arrangements enabled the rapid conveyance of raw materials and goods to these zones and the marketing of the products to ports and to Israel. But with the onset of the terror campaign in 2000, the Palestinians destroyed the factories, looted the machines and inventories, and eliminated a source of employment for thousands of Palestinians. Whereas the owners of the factories were at least partially compensated by insurance, the Palestinian workers were left unemployed. Today, there is only one Palestinian industrial zone of this type, located west of the city of Tulkarem. 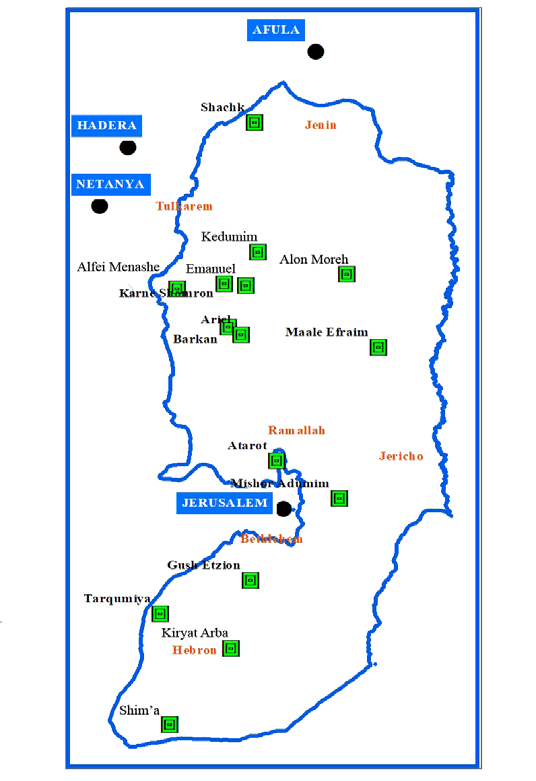 The third model comprises the Israeli industrial zones that were built in central West Bank locations. The then Israeli minister of industry and trade, Natan Sharansky, saw these as an opportunity for Israeli-Palestinian economic cooperation and promoted the planning and development of the zones in state lands under Israeli control. The aim was both to bolster the settlements economically and to provide employment to Palestinians in lieu of work in Israel, which was liable to fluctuations because of the sensitive security situation. The Ministry of Economy invested in planning and building the infrastructure for these industrial zones and encouraged private entrepreneurs to build factories in them that could employ Palestinians. To encourage Palestinians to work in them, the Israeli laws of employment, minimum wage, and national insurance were applied, and transportation to the sites was arranged for residents of the towns and villages in the area. At present, more than 20,000 Palestinians have regular jobs in these zones. This model, which avoided giving veto power to the PA, is the most successful. Palestinian employment is an Israeli security interest, not just a humanitarian need. According to Israel’s security concept, Palestinians who are gainfully employed will refrain from terror activity that could jeopardize their own economic security. The Palestinian interest in having Palestinians work inside pre ‘67 Israel creates, on the one hand, dependence of the Palestinian economy on Israel; on the other, it discourages and even prevents Palestinian enterprise and employment within the West Bank. This can be seen as reflecting the ideology that associates Palestinian economic distress with willingness to take part in the national struggle for liberation from the Israeli occupation. Moreover, the PA does not encourage Palestinians to work in the Israeli industrial zones in the West Bank because it cannot collect taxes from these workers. Hence, it cloaks its opposition in ideological terms of “the occupier’s economic exploitation of the subjects in the occupied territories.” This is despite the fact that such West Bank employment, along with the Palestinian employment in Israel, drive the Palestinian economy. At the start of the Oslo process toward the end of 1993, it was clear to Israel that promoting Palestinian economic prosperity would influence Palestinian public opinion toward economic and civil cooperation with Israel. Shimon Peres, Nobel Prize winner and visionary of the Middle East peace process, wrote about the “new Middle East.” He believed that diplomatic peace between Israel and its neighbors could bring technological progress, knowledge, and modernization to the Arab world. Many Arabs perceived this vision, which won great support in the Western countries, as an attempt at a Western takeover of the Arab countries and their resources, particularly their oil. In 1994, Israel and the PLO signed the Paris Protocol. This economic pact created a common tax structure for Israel and the PA for the interim period leading to the establishment of an independent Palestinian entity. The agreement was intended to give the Palestinians access to international markets while providing a stable currency, trade relations, and international standardization and preventing the smuggling of goods between Israel and the PA. Nevertheless, the Palestinians perceived the agreement as a means to curtail the PA’s economic development and boost Israeli control over Palestinian trade policy and customs duties. The Oslo vision of peace also fostered the initiative to establish a series of joint industrial zones along the future border between Israel and a future Palestinian sovereign entity. In the early stages, the idea of economic cooperation sparked strong interest on both sides. It was implemented, however, only in the Gaza vicinity, where the borders were not subject to dispute. It was not implemented in the West Bank. The Palestinians feared that creating these zones would establish facts on the ground that would give Israel possession of West Bank lands and a pretext to reduce Palestinian labor quotas within Israel. Israel and the PA occupy a small space, and economic interactions between them are a necessity. If there is to be an orderly relationship and even economic cooperation between the two entities, their respective economies must be kept separate. As soon as the PA attains full responsibility for its economy and can conduct its economic policy independently, it will understand its own needs and economic affinities and will be able to choose the areas in which it wants economic ties with Arab countries, with countries outside the region, and with Israel. Only in a situation where the Palestinian leadership can make choices, based on economic considerations, can the PA determine which economic relations with other countries and with Israel specifically are advantageous to it. The problem is that, currently, Palestinian economic policy is driven primarily by the desire to damage the Israeli economy, whether in the West Bank or in Israel itself. Israel fears disengaging from the Palestinian economy, both specifically with regard to employment and more generally with regard to the PA forming economic, and diplomatic ties with hostile elements in Arab countries. Israel also fears an economic collapse and humanitarian catastrophe in territories that the international community still perceives as occupied by Israel and under its responsibility. The Palestinians understand the Israeli trepidation and leverage it to directly blame Israel for the Palestinians’ relative economic distress. The problem is that, at present, the Palestinian economic policy is primarily driven by the desire to damage the Israeli economy. Economics, however, has its own laws. The demand of Israeli employers in the Israeli industrial zones in the West Bank for Palestinian workers, and the supply of Palestinian workers for these zones, strengthens relations between Israeli entrepreneurs, and Palestinian workers, whether in the West Bank or within Israel’s pre-1967 “Green Line.” Employing Palestinians fosters positive daily interactions between Israeli and Palestinian workers, mutual familiarity and understanding, and sometimes, even friendship. The Palestinians who work in the Israeli industrial zones and honorably provide for their families are aware of their personal and economic success compared to their neighbors and friends who are employed in the PA or unemployed. The attempt by Palestinian radical elements to portray the workers as “collaborators” has not succeeded. The contact with the Israelis leads the Palestinian workers to make a social comparison with Israelis, not with Arabs in Arab countries and in Gaza. This social comparison has two contradictory effects: on the one hand, enhanced motivation for personal economic advancement; on the other, frustration over the diplomatic state of affairs and over the PA’s conduct. Many Palestinian entrepreneurs are now concerned that, both because of the labyrinthine Palestinian bureaucracy and because of the corruption and extortion practiced by elements that are under PA protection, they are not afforded the opportunity to build factories in the PA. They have two alternatives: to emigrate from the region or to take refuge in the Israeli industrial zones, whether by leasing land for independent factories or collaborating with Israeli industrialists. Unfortunately, a Palestinian industrialist who does business in an Israeli industrial zone is exposed to the Palestinian boycott of Israeli products, or BDS, which sees him as a collaborator with Israel; and to the high operative costs of paying for wages, social benefits, workers’ health insurance, property tax, and security as in any Israeli factory. Nevertheless, demand for establishing and operating Palestinian businesses in the Israeli industrial zones is increasing. Donors have channeled funds to the PA for numerous planned projects that have never been implemented, and the purported reasons always involve pointing an accusatory finger at Israel. The countries that contribute to the PA continue to attempt to strengthen its economy, even though the PA itself does not show much enthusiasm to do so. According to the donor states’ naןve Western outlook, the professed Palestinian interest matches the actual Palestinian national interest of building the economy and infrastructure for an independent state that is not dependent on Israel. Hence, the donors have channeled funds to the PA for numerous planned projects that have never been implemented, and the purported reasons always involve pointing an accusatory finger at Israel. It is hard for Westerners to comprehend the tacit Palestinian leadership’s need to handle the planning and the funding as it sees fit – with money channeled to serve the Palestinians’ own interests, such as paying salaries to PA employees, and to convicted terrorists and their families. Palestinian leaders claim to favor promoting the development of the Israeli industrial zones in the West Bank so that, when Israel withdraws from the area, they can be transferred to Palestinian ownership. Anyone who believed that these zones could become a model for the Palestinians and for economic development in the region has been disappointed. Both the PA and Palestinian businesspeople view with envy the successful economic cooperation between the Palestinian labor market and Israeli industry. This envy intensifies hatred and the desire to damage Israeli industry through the international-boycott weapon led by the BDS movement, instead of striving for the good of the Palestinian people and the flourishing of their economy, focuses its efforts on vilifying Israel and thereby inflicts harm first of all on the Palestinian workers, their family members, and the Palestinian economy as a whole. Even if and when a Palestinian state is established, the Palestinian economy will require Israeli sources of employment. Hence, it is fitting and proper to encourage the economic and human cooperation between the sides on the way to establishing independence and a historic reconciliation. The Israeli-Palestinian sphere can then become an oasis in the heart of the Middle East.